Honestly, I can think of a million reasons why it is easier to play it safe, and only bloom when conditions are right. Yesterday, I noticed that one of my Crinum is about to bloom against all odds. Crinum normally do not attempt to bloom in an early Spring garden, less than a few weeks after a freeze. Just a week ago, this Crinum looked completely dormant…..and yet, here she is blooming. My flowers continue to teach me the importance of blooming in spite of your surroundings or circumstances. Crinum are hot weathered beauties. These bulbs are truly sun lovers. I’ve seen many old Crinum blooming beautifully in the middle of a hot, dry lot where a house once stood. All it takes is sunshine and a little rain. Our gardens have had neither summer heat or rain. We’ve actually had late surprise freezes and ridiculous, unpredictable weather. Most of my Spring bulbs and Poppies froze as they tried to bloom. It’s been a strange Spring for sure. The last thing I expected to see would be a Crinum bloom. I wonder if she looked around at the winter garden, void and quiet, and decided she had had enough. It was time to break the dormant season and spread beauty to the lifeless gardens around her. Flood trauma, displacement, exhaustion, confusion and at times…..void and quiet. Honestly, there are times it takes a lot of energy to bloom. It is so much easier to to tell myself that I can just rest and wait. I can bloom later when I get back into my own home, or my own furniture or my own this or that. 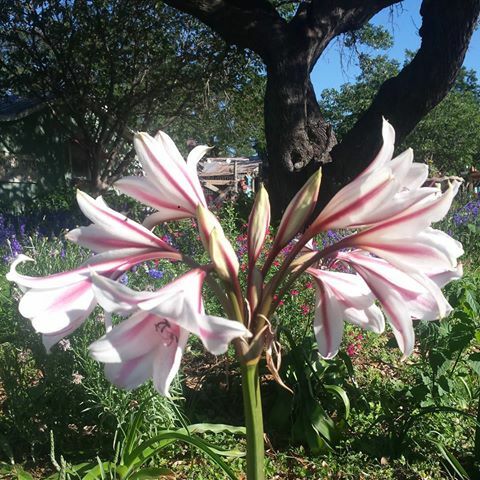 But…..I when I look upon my Crinum blooming against all odds, I feel inspired. I am reminded there really is never a perfect time to bloom. Life is simply not perfect. There will always be a challenge, a low point, an obstacle or a hurdle, as we muddle through our gardens and our lives. Every day, we must ask ourselves a simple gardening question. Will we wait to bloom? Or will we bloom where we are planted…..just for today. So, today….I choose to bloom. Maybe yesterday, I struggled to find the energy. Today, I am reminded of the beautiful verse “The steadfast love of the Lord never ceases. His mercies never come to an end. They are new every morning.” Each day is a choice……. So today, I choose to be like my beautiful Crinum, and bloom. I choose to risk the freeze and other reasons I have to be dormant. I choose to bloom, regardless of where I am or what others are doing. I choose to bloom because today, that is where God has planted me. There is nothing more lovely than a Crinum….and all this time I thought I had to wait to see a beautiful Crinum bloom. Happy Gardening, my friends. Choose the bloom.